Donald Trump and his new running mate, Mike Pence, might not agree on everything. But they share at least one common Republican view: The idea that cutting taxes boosts the economy. Trump has proposed slashing the top tax rate on the wealthy to 25%, from 39.6%. He would also eliminate the estate tax and the Alternative Minimum Tax. And he has proposed lowering the corporate tax rate to just 15%. As governor of Indiana, Pence pushed for a big cut in the state's individual income tax, already the second lowest in the nation. "This reduction in taxes will unleash half a billion dollars into the private, voluntary economy every year," Pence said in his first State of the State address after taking office in 2013. "Letting Hoosiers keep more dollars to spend, invest or save will be good for Indiana families and businesses." He got half of what he wanted: A 5% cut, bringing the tax rate down to 3.23% over the following two years, according to Richard Auxier, research associate at the Tax Policy Center. Pence also eliminated the inheritance and estate taxes that year, a benefit to the rich, and lowered corporate taxes. 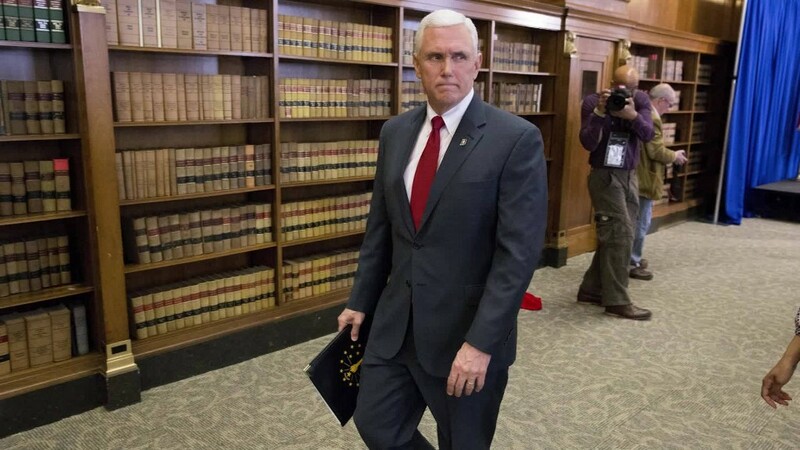 As a congressman, Pence advocated making the Bush tax cuts from 2001 and 2003 permanent and came out in favor of a flat tax, which he said would be simpler and lower Americans' tax burdens. But while Trump and Pence both advocate cutting taxes, their policies may lead to very different outcomes. Trump has proposed one of the world's most costly tax plans and it would increase the national debt "massively," according to the bipartisan Committee for a Responsible Federal Budget. The committee estimates Trump's plan will reduce money going into federal coffers by $10.5 trillion in just the first decade. At the same time, he'd also increase government spending by about $650 billion. The Trump campaign maintains his tax plan would generate enough economic growth to pay for itself. But fiscal experts have called that into question. Pence, on the other hand, has benefited from a growing economy in Indiana and nationwide. The state had balanced budgets, as required by law, and even ended fiscal years with surpluses. The Republican National Committee is already touting Pence's economic record: "Governor Pence is an experienced public servant and a solid conservative whose policies have led to the longest period of uninterrupted job growth in Indiana's history," it said in a statement Friday. During his tenure, the state's unemployment rate fell from 8.4% to 5%, thanks in part to an upswing in manufacturing. Auxier noted that the national unemployment rate fell from 8.3% to 4.7% during that same period. Also, in the Hoosier state, the governor has somewhat limited powers when it comes to budgets and finances, said Andrew Downs, associate professor of political science at Indiana University Perdue University, Fort Wayne. Ultimately, lawmakers control what happens to tax rates. "In Indiana, when things look good financially, the credit has to be spread," Downs said.